I recently wrote about some of the data compiled from our recent Treasure Chest Kickstarter project on this blog entry, so the statistics for the Treasure Chest are split between that post and today’s post. If you love stats, here’s the data for Euphoria and Tuscany. The intent of these posts is to give other project creators a more detailed, behind-the-scenes look at our data than what they can see on the Kickstarter project page. Please keep in mind that this is data for our fourth board-game related Kickstarter campaign, so if you’re a first-time creator, the percentages may be more relevant than the total values. I’m not too concerned at this point since the Treasure Chest was an accessory, not a game, but it’s something I’ll keep an eye on for our next project. As was the case with our last few projects, our fulfillment system allows us to offer low pricing worldwide (as well as shipping from within the EU, Canada, and the US to avoid imposing customs fees on backers). The “shipping per backer” total shown here is the total shipping cost to us (freight + courier); $10 of that was included in every reward. 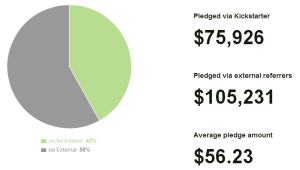 A few things to note: The “total backer” number is less than the actual number of backers because some backers pledged at the $1 level (no shipping involved for the backer toast). Also, Croatia stands out a bit here because even though it’s part of the EU, Amazon.de and Amazon.co.uk won’t ship there via multi-channel fulfillment yet for some reason. The numbers are pretty much on par with Tuscany. My goal is to figure out worldwide shipping (and other factors that are compelling to international backers) so that backers are evenly split 50/50 between the US and the rest of the world. A new element we factored into the Treasure Chest campaign was timing as a premium option. For $33, you could pledge to receive a Treasure Chest in January 2015. Or you could pledge $39 to receive your Treasure Chest in December (this was also applicable to the $59 level, with extra stuff included in that reward). We’re able to offer that premium option by completing production on the Treasure Chest by late November and air freighting the December copies right away, followed by a regular ocean shipment of the January and post-Kickstarter copies. I’ll weigh in on whether or not this was a good idea in December, but for now I have the data for the breakdown between the two. I’m pretty pleased with this breakdown. The air freight option wouldn’t be worth it if we’re only shipping a dozen games to a certain area, but it worked out well here. I probably wouldn’t offer this option for any project, but if we’re trying to deliver some products by a certain seasonal date (i.e., before a big convention or the holiday season), it’s something I would consider doing again. 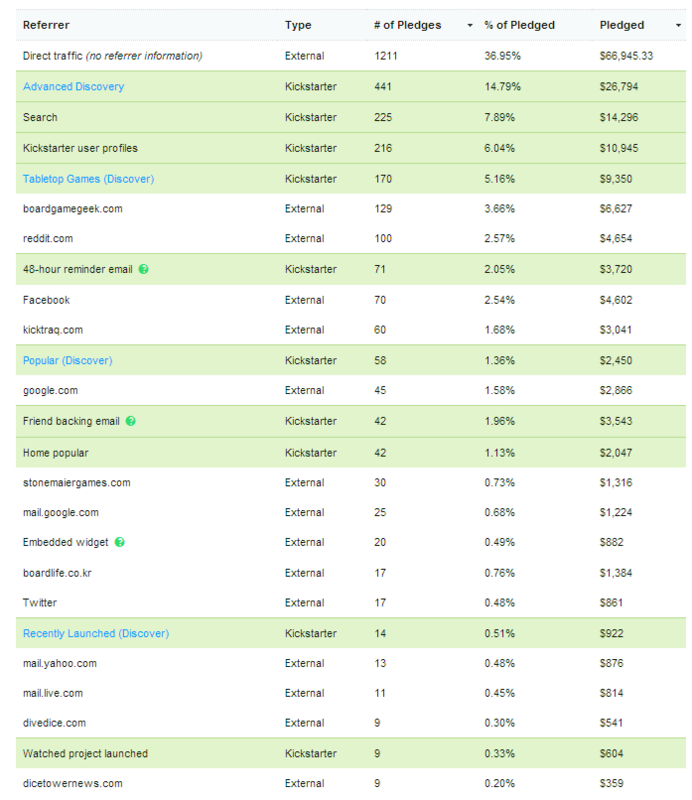 The “direct traffic” at the top of the chart likely refers to backers coming directly from our e-newsletter (MailChimp). We had about 7,700 subscribers, so 1,211 of them pledging to the Treasure Chest is a solid conversion rate. That compares to 379 direct traffic backers on Euphoria and 1,104 on Tuscany. While I was pleased with our BoardGameGeek ads for the Treasure Chest (info here), the overall numbers of backers from BGG was down quite a bit (both Euphoria and Tuscany attracted over 300 backers from BGG). I think that’s mostly a result of us not being able to list the Treasure Chest as its own product on BGG, unlike a game, which has its own page, can get on the Hotness list, and can have photos listed on the homepage. I’m always intrigued by niche websites and blogs that directly refer backers to us (for Tuscany the big one was Shut Up and Sit Down, which didn’t mention the Treasure Chest). In this case, two websites stand out: boardlife.co.kr and divedice.com. Both are Korean websites, and I appreciate them linking to the Treasure Chest! Kicktraq continues to be a hugely invaluable resource for people interested in any Kickstarter campaign–in addition the 60 backers it referred to the Treasure Chest, it referred 94 Tuscany backers to us and 249 backers for Euphoria. I’m happy with the Treasure Chest campaign. Perhaps the one thing weighing on me from both Tuscany and the Treasure Chest is that neither campaign seemed to capture the same fervor that Euphoria did. Euphoria had more backers than Tuscany or the Treasure Chest. The click-through rate on our BGG ad for Euphoria was one of the best BGG has ever seen. Euphoria spent more time on the BGG Hotness list than Tuscany, and it attracted 3x as many backers from Kicktraq. Story. Euphoria had a fictional, speculative story interwoven into it–it had a worldbuilding element not present in our other products. Tuscany is more of a real-life simulation, and the Treasure Chest doesn’t have a story. Backerseven had an impact on Euphoria’s story, as they were able to vote in the Tournament of the Apocalypse. Funding Goal. Euphoria had the lowest funding goal of any of our projects ($15,000). Custom Dice. Euphoria had custom dice. Maybe that’s a factor? All of our products have plenty of fancy tokens and resources–are dice more compelling than any of them? Free EU Shipping. Euphoria offered free shipping for the entire EU. This was a miscalculation on my part, but it made the project very compelling for EU backers. Aside from the UK and Germany, where we’ve consistently offered free shipping, 14% of backers for Euphoria came from the EU, compared to 10% for Tuscany. 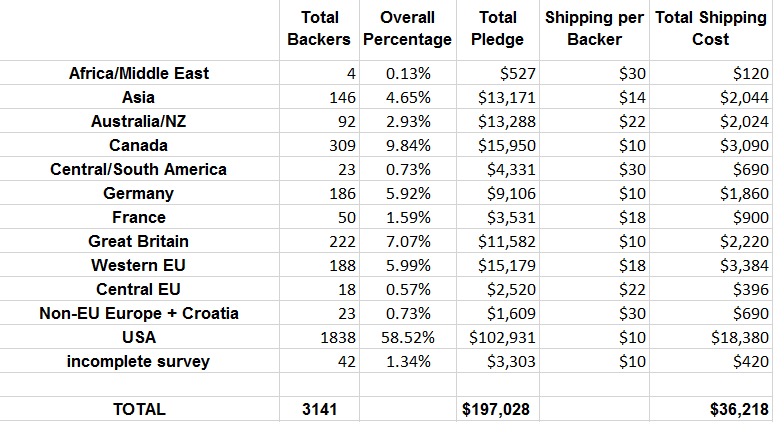 Backer percentages from Asia and Australia/NZ were way up for Tuscany, though. Big Final Stretch Goal. The final stretch goal for Euphoria (doubling the number of realistic resource tokens) prompted a huge upswing in pledges the final two days. 1,264 backers joined the project in that time, compared to 660 for Tuscany (which had a much bigger Day 1). Project Glut. Finally, Kickstarter continues to attract more and more projects, so perhaps part of this is symptomatic to Kickstarter as a whole. I try to view each project as its own entity, but these projects don’t exist in a vacuum. It’s hard to tell which differentiating data points are relevant! I’d love to hear what you think. I’d like to take this moment to point out the absurd disparity in “direct traffic” vs all other sources. I’ve always argued this number is inflated for a variety of reasons (which are difficult to test for), but to have it be so disproportionate on a campaign where I know Jamie is really pushing his existing fan base highlights this even more. I only wish KS had a true referral tracking system. It’d help project owners know where their traffic is actually coming from and which sources are truly the most effective. Kicktraq: I wish for the same thing! :) Is it a coding issue, or is it possible and they’re just not doing it? I’ve heard that IndieGogo is better at providing accurate tracking data, but I don’t know if that’s true. As far as I’m aware, IGG’s system is better simply because it’s persistent. On KS, if a backer comes in through Kicktraq or BGG or whatever, then changes their pledge later, they get put in the direct bucket and pulled out of the Kicktraq bucket (at least last time I tested it). The same goes for favorites. If a person comes in through Kicktraq, clicks the favorite button, then comes back later, it gets counted as a favorites reminder. I don’t think it’s difficult programatically to persist the referral during the pledge, I just don’t think KS has a reason to do this. Tracking separate referral codes would be a little more difficult, but I think it’d be a robust tool in the hands of the project owner. Think if you could meter all of your marketing outlets separately and even A/B test on the same site. You could run 3 different ads on a site to see which ones convert the best. Currently you can’t do that on KS or even on IGG as IGG referral codes are user-based. I’m curious why you don’t think Kickstarter has a reason to do this. I would think they’d want to provide creators with that type of information, as it would enable them to figure out the most productive ways to generate more traffic on Kickstarter. Not that they specifically wouldn’t want to do a referral tracking system, but I think they must have some internal path and unless it’s already on their plan, a deviation is unlikely. KS actually took some features away from the original tracking system. It used to actually store the referral code (sometimes), but they now strip anything that’s not an actual KS internal referral code (the ones that are color-coded green). Links that used to pass the ?ref=kicktraq referral now get stripped and dumped into the “internals” bucket UNLESS they come from Kicktraq.com, which then might show up in the domain referral bucket. I assume if they had any interest in a more robust tracking mechanism, they would have fixed/added it at that time. Interesting that they actually regressed in terms of tracking. I’m very curious about why they did that. I love these posts – thank you so much for sharing all of this detail, Jamey! My guess on what made Euphoria so special and such an “event” on Kickstarter is the special premium resource tokens as part of the game. Tuscany and Viticulture didn’t have such ridiculously amazing resources, and the Treasure Chest doesn’t have a game. I think the combination is what set Kickstarter on fire for Euphoria. Michael: Yeah, I was wondering about the impact they had. Tuscany had tons of custom meeples, but it kind of surprised me how little attention they got. Maybe I overestimated their appeal. My take on why Euphoria did better than the other projects (although the other projects have really done quite well, in fact): I backed Euphoria because it is such a unique game in theme and mechanics that support that theme. It really has a dystopian feel while being played. The tokens ( I got the deluxe version) are magnificent and the dice are OK (IMHO). The board is the most gorgeous board I have ever played on. All of these together make Euphoria a real unique game. The dice – meh! Thomas: Thanks for your input. The thing is, I think most of what you just said is accurate about Tuscany other than the unique theme. Tuscany has mechanisms that support the theme, it immerses you in the world of winemaking, the tokens are of the highest quality, and the art is excellent. Thus the differentiating factor is the theme itself, which is largely subjective…but maybe more gamers who are willing to spend $50 on a game prefer a fictional theme like Euphoria’s? Although it might be the case that Viticulture’s theme is as strongly linked to the mechanics (I can’t opine until I get my Tuscany pledge :) ), remember that you’re approaching that evaluation from te perspective of someone intimately familiar with the game. I didn’t back Viticulture because, on paper, it looked like Yet Another Medieval Farming Worker Placement Game. Nothing about the rules suggested mechanics that were unique to winemaking from my 10,000 foot perspective. By contrast, Euphoria’s knowledge mechanic is obviously thematic to a dystopia and an interesting method of countering the benefits of extra workers. Similarly, the construction tiles add an extra sense of interaction in a traditionally solitary genre. To be clear, I am not arguing that Viticulture’s rules are not unique, interesting, or thematic, only that those aspects weren’t as immediately apparent when set against a well-worn style of game. Joshua: That’s a good point that it’s tough for me to look at my games without some level of bias. That reinforces my belief that the “what’s unique about this game” section of any project page, including my own, is really, really important. Thanks! Being a non-gamer my opinion is not as relevant, but if one were to buy on name alone, 95% would buy Euphoria over the others. Since I’m soon to launch on Kickstarter, I love that you do this and all the info about international shipping is of great interest. Thank you. While I always appreciate these retrospective posts, I think you are doing yourself a huge disservice in comparing your 4 projects. Viticulture (which I missed) was your 1st project. Euphoria was a self-contained, bright, beautiful game with a catchy name and very interesting theme. Tuscany is an expansion. The sales of a project which requires another game to play are never the same as sales of a base game. Although you offered us the option to buy Viticulture, too, not everyone can afford that much money at once, or has much interest in wine (or booze). Finally, the Treasure Chest had the double fault of a competing ending date and (as stated before) is not a game. What I see in your numbers are 4 seperate data points which have only one trend – 1 thing in common: a guy who does his research and cares about his community. Derik: Even though the projects are different, I think a lot can be learned by comparing them. As you mention, I really care about my community of backers (and readers! ), so when that community is increasing but backers are decreasing, that’s a sign of something. Derik – you pretty much said exactly what I was going to say so I just thought I’d add “ditto”. Jamey, I really don’t think you should compare them. Think of your repertoire: 1st Kickstarter – a game from an unproven game designer with a very specific theme, 2nd – a dystopian styled game with a cool name and cool push-mechanism (that has ended up winning some awards over the past year! ), 3rd – an expansion to that previous specifically themed game and 4th – a luxury kit of tokens that people don’t NEED to play anything they’ve already got. There is certainly some brand-name loyalty that gives you carry over from project to project but each Kickstarter has to find its own niche and its own audience. Lori: That’s a fair point. Every product has its own audience. I certainly don’t want our fans to blindly back everything we do, but I guess I just want to continue to look at everything we do with a critical, discerning eye. I want to make better things and better experiences for our backers, improving one project after the next, not regressing. Marj: Thanks for your feedback! I’d love to know how you’re getting that 95%. I’m not disagreeing with you, but I think it largely depends on the gamer. Tens of thousands of people love a farming game called Agricola. Puerto Rico is a massively successful game. Euphoria is a great name, but unless a game has a terrible name, I don’t think it plays much of a factor compared to all the other variables. I think it’s difficult to compare the games. They are pretty different in theme and mechanics. But I would say Euphoria is more unique and interesting of the two. Viticulture is thematic, but it’s possible that the game and mechanics might be less interesting (and not as many people would be excited to back it). Someone might compare it to existing worker placement games they have and might not see enough differences to pick Viticulture+Tuscany up. Plus, as mentioned, Tuscany was an expansion, so for those that don’t have the base game it’s $79 vs. $49 for Euphoria. I don’t think non-standalone expansions do as well as a standalone game just due to the cost to get into it (expansion+base game). Or maybe some people played Viticulture and didn’t like it and wasn’t interested in the Expansion. And I suspect the dice and realistic tokens from Euphoria might have been a bigger draw than the coins in Tuscany (I’ve seen various coin KSes in the past), so that could have put more “urgency” to back than Tuscany did. You and Derik have a good point about Tuscany being an expansion, not a new game. It has a higher barrier to entry than a new game. And don’t get me wrong–I’m extremely pleased with how it did on Kickstarter, and I hope that success continues in retail. Tuscany had coins and tons of custom meeples…do you think most gamers would put custom dice above custom meeples? The time of year point is interesting. That certainly could be a factor. Hi Jamey, I agree with Vinson & Derik, the main differentiator is that Euphoria was a stand alone game (a unique and beautiful game with outstanding production quality) as opposed to the other releases. As simple as that in my mind. It will be fascinating to look at the stats for the four releases to date in 3 years time and see how they faired – I suspect that Euphoria will be significantly ahead of the others…how’s it comparing to Vitriculture as of now? Curtis: Thanks for your input. Perhaps I’ve underestimated the impact of the nature of a stand-alone game compared to an expansion. It’s hard to compare the post-Kickstarter sales at this point. Viticulture’s first print run was much smaller than Euphoria’s, and it had an MSRP of $60. It sold out to distributors immediately. Euphoria had a much bigger print run and an MSRP of $70, and it took longer to sell out (months instead of hours). The Legacy elements and custom meeples are a great touch in Tuscany. I know my problem was that I didn’t discover the legacy element until very late (as you’ve discussed, backers tend to skim). Personally, this component aspect didn’t play much of a role in my decision making process. When I saw you offer extra dice in Euphoria, I DID think about the ability to use them elsewhere. . . But it never really happened. Just as I doubt anybody uses their Tuscany meeples in other games. I truly think the issue is: base game vs. expansion/accessories and simulation vs. a unique, compelling story. I would say that, at the very least, custom dice are more reusable outside of the game. As for mechanics, yes Tuscany’s legacy elements are interesting (I was actually referring to base Viticulture instead of Tuscany mechanics). But they are added-on mechanics and with add-on mechanics (unless in the case where the base game is barely playable without them), I find that you need to play with more experienced players (less to teach if just teaching the base game). Plus, with mini-expansions, I find that you rarely use all of them (like all the mini expansions in Alhambra or Carcassonne), so the expansion is less appealing unless the base game is a regular in your playgroup(s). I wonder if one big expansion might work better than a mini-expansion collection for casual plays since it’s more cohesive and is more easily explained. Anyway, I’m not sure. Just throwing it out there. I think Euphoria was much more “exciting” as a Kickstarter campaign due to amazing realistic resources (which really had not been seen before, anywhere, that I know of). Especially the SHINY GOLD. I think many people had the idea that they could also use these in other games. Thankfully, the Treasure Chest is making those available to more people now. The colors and the art of the Euphoria board are also very appealing. The dice are also nice, but not (to me) as much as an incentive as the resources (others may be big dice enthusiasts though, and that could be their favorite thing). Regarding the meeples and money from Tuscany…both (in general) are available from many other sources, either as part of a game or from separate accessory companies (some with very detailed paint schemes). Still nice to have specifically for Tuscany, but not the same “excitement” or exclusivity. Some people may have been expecting/desiring “over-the-top resources for all Stonemeier games now, with Euphoria setting the standard (not knowing about your concept of focusing on 1 or 2 extra-special items per game, which may NOT happen to be the resources). However, as the Tuscany total funding showed, it was still a smashing, successful campaign! My opinion about comparing your projects is that even though they do not belong in the same bag you can make many useful conclusions if you also include other KS projects in that bag. Taking the “Treasure Chest” as an example, that backers number may be lower than your previous projects, but if you compare it with other projects offering premium components for games you will find out that you are doing a pretty good job. Now, on the custom dice topic, it is certainly a great upgrade component, but I am not that sure that it is a ‘wow-factor’ for a KS campaign.On the other hand, I think a special extra component is a must-have for a successful campaign and the custom dice seem to be a hot trend among them. Foskolos: Thanks for your feedback. I like your point about comparing the Treasure Chest to other similar projects (instead of my unrelated game projects). As for Treasure Chest? Yeah, turns out I was completely wrong about luxury resources ‘not really going to make much of a difference’. I want to play as many games as possible with realistic resource tokens in the style of Euphoria now that I’ve played Euphoria with them. With Tuscany, there were two factors preventing me from backing it. The one likely to be more relevant as data to you being that it was expansion to a game I didn’t own; while you offered a pledge level that would get Viticulture as well, I’m… Cautious… of buying game + expansion, so I wasn’t giving it much attention (To the point that I’ve only learnt in the past couple of days that it uses the unlock system of the Legacy mechanic.) – I might have looked past that, after checking reviews of Viticulture itself, and considered going for the relevant pledge level for that except the other reason, which is likely more individual – The campaign was so far after my stopping backing stuff (for the most part, exceptions to that being few and far between, while being low cost and only involving digital delivery) due to having a move coming up that… Actually the date it ended was in the same week as I moved, by sheer coincidence. I’m honestly surprised I noticed it enough to go ‘Yeah, not going to go down the game + expansion path’ rather than just stopping at ‘Maybe if it was launched in May’. Gizensha: Thanks for your feedback! Yeah, the game + expansion purchase can be a bit daunting for people–I always like to try the original game first before I even consider an expansion, so that makes perfect sense. I’m really curious to see how the Treasure Chest will sell after backers receive their copies and play games using it with their friends and at conventions. My hope is that more people will have the reaction you did when you played Euphoria with those resources and choose to buy a Treasure Chest of their own. You had me at statistics. (1) Why do you want a 50/50 parity between US/Worldwide backers? You’re almost there anyway. I’d rather you ask “What market am I missing because of shipping costs” and look into whether it’s worth it to focus there. I suspect Brazil. I also suggest you look into crowdfunders other than Kickstarter because Kickstarter skews heavily towards English-language projects from English-speaking countries. If you’re a Finnish game fan, you’ll hit indiegogo first because there are more European publishers there (and more RPGs, but that’s just a generalization that Finnish gamers like RPGs and death metal). 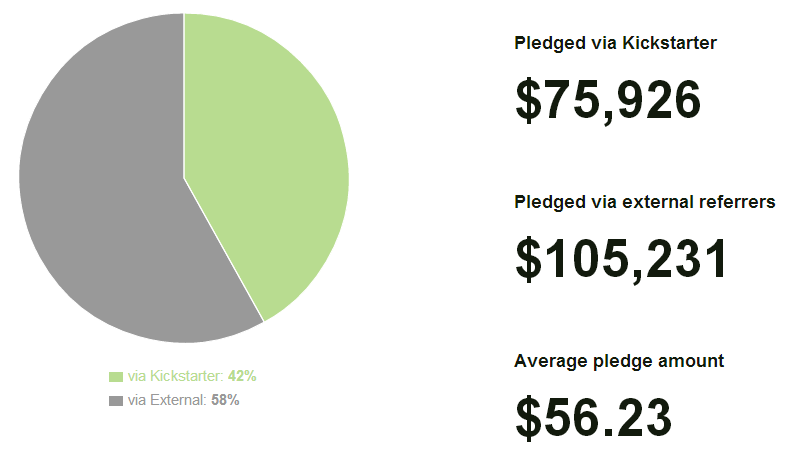 (2) As others point out, Stonemaier’s four kickstarter campaigns don’t a trend comprise. You have apophenia, my friend, the tendency to see patterns where none exist. We all suffer from them – from “I get caught by red lights every time I drive up Lindbergh” to “the girl with fake nails always advances on The Bachelor”. Rather you have several distinct phenomena playing out and you cannot separate them – what econometricians call an “identity problem”. a) Viticulture was your first. You were an unknown. A risk. Then you and Alan delivered fiendishly well on your first game, so well that new copies were going for 50% above retail on eBay until supply was replenished by Tuscany. b) Euphoria was its own game, and it’s an absolute gem. The components are secondary but a big secondary. The mechanics are awesome, novel, fresh and that fantastic Golden Game Ratio of “can teach in thirty seconds” with “strategy is amazingly deep”. Woah. Mind >POOM< blown. c) Tuscany allowed Viticulture's pent-up demand to finally be vented. d) Treasure Chest is purely an accessory, even amazingly well-done. You found a venue for incremental income and you leveraged it. Fantastic. So there's several trends here. In terms of new games – ie, new properties – you're going up. Viticulture to Euphoria. In terms of residuals from incremental sales within-property, you're going down but that's expected. You don't grab new customers from an expansion, you expand value for existing ones. Limited market, limited wallets (after all, you already had a portion of their spend to begin with for the base game). In other words, you want that trend to increase? Next KS has to be a new property. (3) Perspective. I see KS campaign statistics as an attribute, rather than a definition. I might say symptom rather than disease, but that has too many negative connotations. So take your campaign results in light of what you actually offered, as an indication of how what you offered was embraced, and ask why it was embraced as it was. a) What if Stonemaier had led with Euphoria instead of Viticulture? You wouldn't have raised $300K+ on Euphoria as your first game out. But Viticulture would've been larger. The key here is what's the value imparted by being a reliable game company (one of a small number that have raised funds on KS and delivered on-time), versus the value of the intellectual property itself? b) What would non-traditional markets contribute to Euphoria if these markets existed? You had considerable support from vintners and wineries on Viticulture, but surprisingly little support from dystopian regimes on Euphoria. Why is that? ;-) A more realistic way of looking at this is, where can you leverage non-gaming channels? Someone brought up a few months back that there are no gaming stores in countries with conservative Islamic governments because they view games as a form of gambling (dice? cards? alright, I get it), so why not come up with a worker placement game that appeals to conservative Islamic countries? Another perspective point is, why stick to Kickstarter? That's an inundated channel, as you've said. It's a good channel, certainly, but are there other ways to reach your target audience? Here's the interesting point, because Kickstarter allows you to pitch something mid-development, and develop with the campaign, as you did very well in Euphoria. JT: Thanks for your comment. Indeed, Brazil is a major target of ours, and I work with a number of group buyers in Brazil to get more games over there. Why is the 50/50 split important to me? Because it’s important for me to find new, creative ways to reach out to the international community. I think sometimes in the US we think we’re the center of the world, and I’m trying to go out of my way to not think or act that way. 50/50 might be an arbitrary goal, but it’s an important one to me. 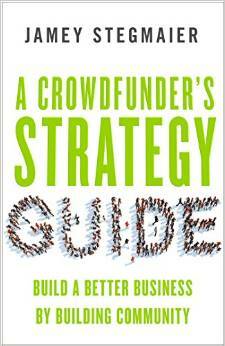 Why stick with Kickstarter? I really like the platform, and a growing number of people are comfortable with it. It works, and it’s great for building community. Just to clarify, Euphoria wasn’t mid-development when it went on Kickstarter. It was about 90% done, and backers provided a helpful final stage of playtesting. Thanks for the clarification about Euphoria’s development state. I didn’t mean to imply it was only mid-development. 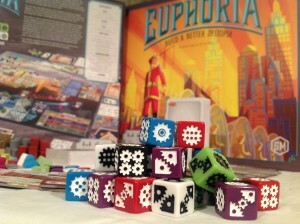 I was – and still am – impressed by the playtesting that was done specifically on Euphoria and I think that offering the print-and-play is something Stonemaier should continue doing. It has this authoritative “We think our games are so good that you’ll buy it even after you can play it on your own”. Kickstarter is a great platform, perhaps the best from the perspective of exposure, search engines, community surrounding it, efficient transactions, and fundraising interface. I’ve heard that campaign management on KS versus other crowdfunders is easier, but I can’t speak to that myself. I only bring up the other platforms because they may have an easier reach into Brazilian or other audiences. So how do you get non-English speakers onto your Kickstarters? (1) Advertise specifically to reach out to the largest under-served markets, using the market languages (Spanish and Portuguese). If you provide a PDF of the rules in those languages, that will help as well. Small incremental cost, perhaps? (2) Build a parallel Kickstarter page in those languages. I think Spanish would give you the broadest market reach, but that may not help you as much if you’re targeting Brazil (though many Brazilians more easily read Spanish than English). I don’t know how much more this would cost you, but perhaps it would be too difficult to coordinate simultaneous campaigns. I know you can find someone to be a Spanish-language web host and to interact with customers as well as translate questions. (3) Generate a Spanish-language edition of your next game. This seems to be the most costly but it would be market-ready. Just thinking out loud how you would hit that 50/50 goal from the 58/42 goal while increasing total market. Absolutely, making our games more accessible to non-English speakers is key. We have a lot of great ambassadors that translate rules for us, and many of them did that for Tuscany specifically for the Kickstarter (knowing that the rules would receive additional formatting and proofreading during the project). Those translated rules were posted on a lot of forums across the world, bringing in more international backers. As for a parallel Kickstarter page, that’s interesting. I wonder if Google Translate already has us covered there, though. As for other language versions of our games, I see it as a two step process. One is to make our games as language independent as possible. If we do that well, it might be possible to do what some companies do–include multiple translated sets of rules in the box (and everything else is language independent). Two is to continue to form partnerships with publishers in other countries (as we’ve done with Morning Players for Euphoria) to print the second editions of our games in other languages.